Yasujiro Ozu's 1953 movie Tokyo Story has always been a cinematic blind spot for me, despite it having a reputation for being perhaps the quintessential film in the Japanese director's canon. I would always hear others singing its praises, including quite often being told by people how they were moved emotionally by the family tale. 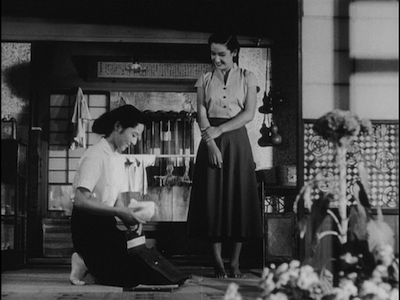 This led me to expect Tokyo Story to be heightened melodrama. 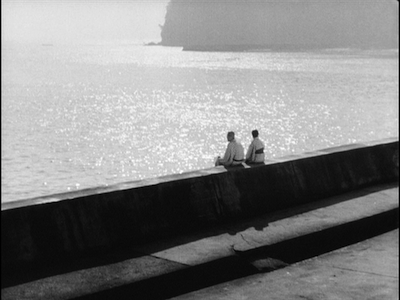 Here are my heartstrings, Mr. Ozu, please go ahead and tug them. I don't think this factored in my not having seen Tokyo Story in a negative way; on the contrary, the reverence with which many held this picture made me wait longer because I wanted to wait for the time to be right, to save the experience until such a time as I could really savor and appreciate it. This, as it turns out, was a smart move, though again not exactly for the obvious reasons. The surprise of Tokyo Story was that it's not the high-emotion tearjerker I suspected, but rather a melodrama of restraint. Its sadness is less the product of tragic events and more the reaction to the same. It's a movie about disappointment and loss, and the profound unhappiness of everyday life. Tokyo Story is a two-part film. Part One is a ten-day trip that an elderly couple take from their home in the Onomichi prefecture to visit their grown children in Tokyo. Shukichi and Tomi, played by Chishu Ryu and Chieko Higashiyama, have had five children in total. Their youngest, Kyoko (Kyoko Kagawa), still lives with them. She is a schoolteacher. A middle child, Keizo (Shiro Osaka) lives in Osaka. The two who live in Tokyo are Shige (Haruko Sugimura), who runs a beauty parlor, and Koichi (So Yamamura), who is a doctor. Their fifth child, a son, died in the war. His widow, Noriko (Setsuko Hara), lives in Tokyo, too, and the couple will be visiting her, as well. The visit in Tokyo is awkward and strained. Shige and Koichi and their families put up their parents and try to entertain them, but it is more out of a sense of duty than it is genuine pleasure for them being there. More than once they complain about their time and the money they have to spend. In the middle of the week, they send the old folks to a seaside spa under the pretext of helping them relax, but they are basically trying to get them out of their hair for a while. Only the daughter-in-law, Noriko, seems at all interested in spending any real time with Shukichi and Tomi. The generation gap is even more pronounced when it comes to Koichi's sons: the grandchildren barely even speak to their grandparents. Quite subtly, Ozu and co-writer Kogo Noda are illustrating the changes in social mores and the altered expectations that have come in the post-War era. There is a divide between how the children feel toward their parents and what they think they are supposed to do. Rather than cherishing the older generation, the younger seems to find them a nuisance. Likewise, the older folks seem to be disheartened by their children measuring their success by a diminished yardstick. 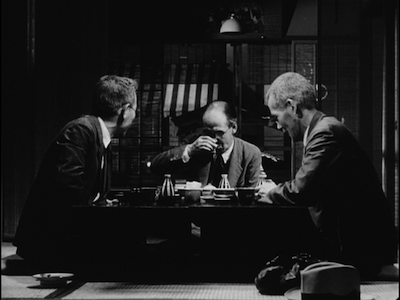 In one of Tokyo Story's livelier sequences, Shukichi goes out drinking with some of his old friends. They get plastered on sake and start to expose the lies their children tell them about themselves--Koichi, for instance, led his father to believe his medical practice was much bigger than it is--and the lies the fathers have told to cover their frustration. One of Shukichi's friends, a former police officer, has been telling the guys that his boy is in a management position at his firm when he is really just a mid-level assistant. These busy lives their offspring bustle about doing don't seem all that substantial. In opposition to this, Tomi and Noriko, the mother-in-law and her widowed daughter-in-law, form a lonely bond outside the circle. While Tomi is also let down by how the trip has gone, she tends to be more forgiving, her natural instinct as the caretaker holding sway. Noriko seems poised to accept a similar role in the family, and by movie's end, she will basically maintain a middle position, forgiving both sides for their failure to see what the other is going through. In a fascinating twist, the youngest girl, Kyoko, is the most angry with her siblings' indifference. Noriko encourages her to have patience. In their parting, sobering exchange, the young girl asks, "Isn't life disappointing?" Her sister-in-law can only respond in the affirmative. Part Two of Tokyo Story is the shorter part. It takes place back at the small town where the family hails from. Events compel the children to have to visit their parents only days after the Tokyo holiday has ended. Here the hospitality shoe would seemingly be on the other foot, though honestly this gathering doesn't go much better. Shige in particular is bossy and cold, and all three of the older children leave again as soon as they can, despite the relative importance of their sticking around. In Tokyo, they came through in the most trivial of situations, but here when it would really matter, they don't come through at all. The movie ends on dual notes of loneliness and possibility: the elderly are more isolated than ever, but Noriko is given her freedom to reengage with life rather than stay wrapped up in her grief. There is a chance that she won't, but the look on her face in the final shots of the movie, as she rides a train by herself back to Tokyo, suggests that she has changed, she has found some contentment. Is it just the good feeling of having done the right thing? Or a commitment to honor what was most recently lost? Setsuko Hara is a familiar face from many Ozu movies. She is a charming actress, and there is something inherent in her screen presence that is likable and immediately engenders sympathy. 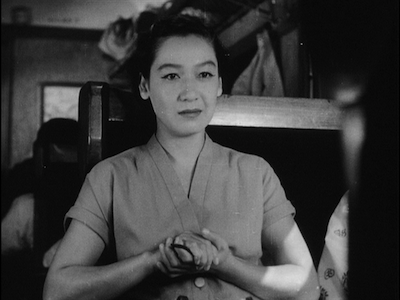 Those final scenes in Tokyo Story--her conversations with Kyoko and Shukichi, and then her train ride--are some of her finest moments on film. She goes beyond being just syrupy sweet and reveals so much more about her character through the tone of her voice and the honest expressions on her face. Her kindness is come by bitterly; we can believe the tragedies of her own life have caused her to be this way. Instead of growing hard against it, she decides to do well unto others. The old man Chishu Ryu is also a regular face in Ozu's filmography. He and Hara may have as much to do with the unique rhythm of the master's movies as he does. They are comfortable with the slow, quiet approach, and they make it seem natural. 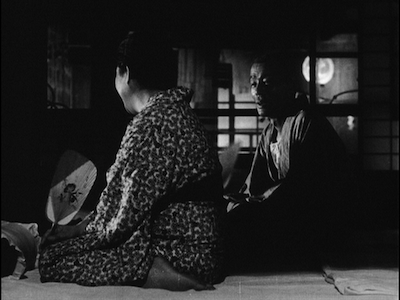 As with the best of Ozu, Tokyo Story is an all-too human movie. 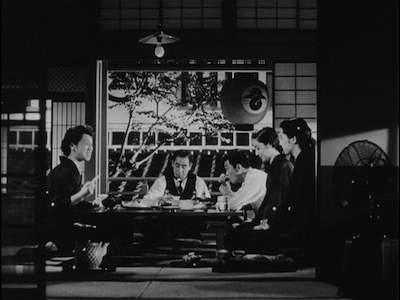 Much is made of Ozu's choice to shoot his films from ground level, with fixed and steady framing. (The camera work here is by Yuharu Atsuta, another regular of the Ozu crew.) This is generally referred to as the "tatami-mat shot." For me, this choice puts the viewer on the same level as the subjects. We are a participant in their lives, sitting with them in their homes. Ozu adds no flash to his stories, he doesn't see a need to amplify events. His movies don't necessarily work as Neorealism, there is still something very mannered and stylized about them, but there is a fundamental honesty to his scenarios that wouldn't be there if he chose to play the drama stronger. It's said that Kogo Noda was influenced by Leo McCarey's 1937 film, Make Way For Tomorrow [review], and there are definitely similarities between the two films. Beyond the shared thematic elements of two older people who feel displaced and unwanted, Ozu and McCarey both have a similar outlook on human nature. 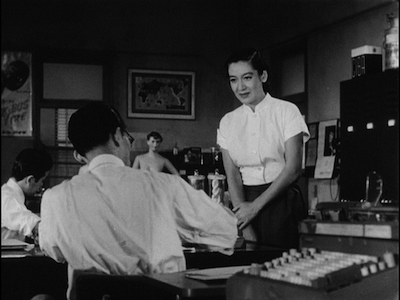 For as soft-seeming and low-key as Tokyo Story can be, it is not without a subtext of anger and cynicism. Ozu and McCarey are both as disappointed in their characters as the characters are of each other. Their disenchantment is born of their stronger belief that humans could do better if only they'd just try. Though Tokyo Story throws most of its sentiment behind the parents, they aren't totally off the hook. Is it really okay for them to be so judgmental of their children and to not accept the lives they've made for themselves for what they are? With this in mind, then the older couple--Tomi earlier in the movie and Shukichi at the end--encouraging Noriko to release herself from their dead son and to try to live and love again can be interpreted as redemption. It's an atonement for the mistakes they maybe made with their own children. They held their expectations too close, and they created a situation where their sons and daughter could only fail, because they could never really have their own lives. They don't want to see Noriko trapped in the same way. It's a strange irony of family--and perhaps Tokyo Story's most perceptive narrative statement--that we can so often wish and do for outsiders that which we can't afford our own flesh and blood.